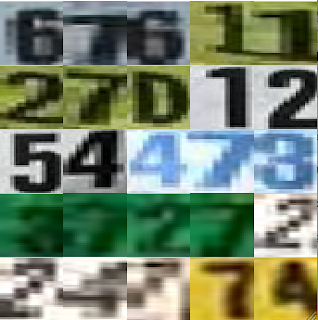 I used the "Robust OCR dataset" below to make a system for reading runner bibs in video. Standard ML techniques give fairly good results without much tweaking -- AdaBoost with stumps to go through all connected components (in thresholded image) and generate potential candidates, SVM/Gaussian kernel to classify those candidates into digits. Here's a screenshot and a video of this system in action. I've collected this dataset for a project that involves automatically reading bibs in pictures of marathons and other races. This dataset is larger than robust-reading dataset of ICDAR 2003 competition with about 20k digits and more uniform because it's digits-only. I believe it is more challenging than the MNIST digit recognition dataset. The dataset file contains raw data (images), as well as Weka-format ARFF file for simple set of features. For completeness I include matlab script used to for initial pre-processing and feature extraction, Python script to convert space-separated output into ARFF format. Check "readme.txt" for more details.